Lucille Ball had really nice taste in her kitchenware. 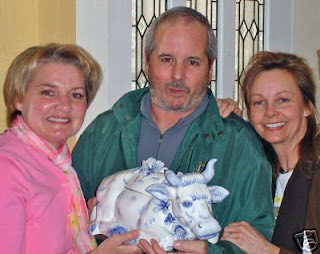 Her son and daughter-in-law are auctioning a cow soup tureen to raise money for their nonprofit Boulder City Ballet Company. Read about the tureen or see more photos and bid. Unfortunately, I don't have the space to properly display this lovely item, so I won't bid on it. You can see another example of Lucy's taste in home furnishings in Tom Watson's article about the "wrap event" for Universal City Studio's "Lucy: A Tribute" in Hollywood.